← Powershell script to find the ilo details of the blade running on HP Enclosure. Pls see my other blogs on Trend DSM 9.5 and 9.6 upgrade. Now we can see the recommendations and updates for windows 10. When Trend DSM 9.6 version was available for the download it was said that around NOV 2015 it will support the windows 10 version but it got delayed and Trend now officially announced that from new Trend 9.6 SP1 upgrade , the new agent it will support the windows 10. We need to do the below two procedure in order to protect windows 10 using trend agent. Upgrade your Deep Security Manager to v9.6. 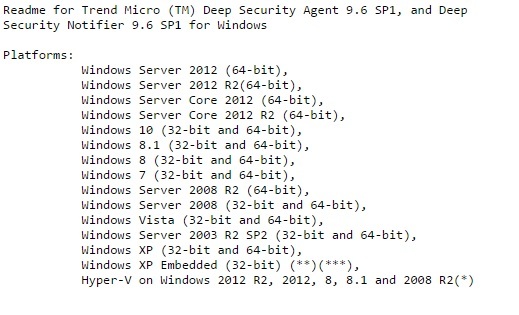 This will allow support of Windows 10 and still allow management of your current Deep Security v9.5 Agent/Agentless environment and most important is update the DSM 9.6 SP1. Also note for agentless support is not available at this time as VMWare has not released an updated ESPEC (VMWare tools) support for Windows 10. As per the information from VMWare the support for this is targeted for first half of 2016. However, it is unclear if this will be for NSX only or if it will include vCNS as well. So for windows 10 in VMware environment, we have to go with agent-based protection which is a big set back for Anti-Malware products and also for the customers using agnet-less protection in their VDI environment. Download link for the windows 10 agent. Note : Tested with just Trend 9.6 without SP1 for the windows 10 with old agent , it worked for me but it is recommend to go with Trend 9.6 SP1. Next blog we can see the steps to upgrade the SP1 in which we need to follow some important steps. This entry was posted in Trend Deep Security Manager - ( DSM ), Trend Micro Deep Security, Trend Micro Deep Security 9.5 ( VDI Environment-Agentless Protection ) and tagged Trend DSM, Trend DSM 9.6 sp1, Trend DSM upgrade, Trend DSM windows 10, Trend Micro Deep Security. Bookmark the permalink.